Big Wheel Building: Brownie points on offer! 65,329.26 brownie points go to the first person that can correctly identify each racer in the photo above from the start of the '98 Iditasport Extreme. Start from left and work your way right. There are 15 racers. P.S. In the very likely event that no one gets all names correct, partial points will be awarded to whomever gets the most. Is there no header picture showing up? Sorry for hijacking this post with a request, but I can't name all those racers: Could you sometime do an entry regarding hydration. How you create, pack, and carry your water supply? Header pic is showing up; it wasn't this morning even though I saw the photos in the 'warm feet' post (didn't check over the weekend). Stamstad was sponsored by Chevy trucks? I must really know nothing about the endurance racing scene. Geez--I thought *someone* might at least offer up a few guesses. Mike, the pic is showing now. Thanks! Okay, second from the left is Stamstad, that's the easy one! Next to him I'll say that's fassibinder, and then someone in the backround. After that it's you, Mike. Then I haven't a clue who the rest are except to say that one of them is probably Rocky, but I don't know what he looks like. Okay, I tried! Who knows anymore? 4 The dude that stole your film?! Stamstad and you. Thats all I can come up with, yep. Just out of the frame all the way to the right is another Andy from the UK. Some of the most anxious moments of my life, right before the start of that race. Nothing could have prepared me for how unprepared I was for that experience. And the conditions couldn't have been better! Is Cullen Barker in there? Thats all I can do. The cyclists were last to leave the start that year, so that pic only shows a partial field. 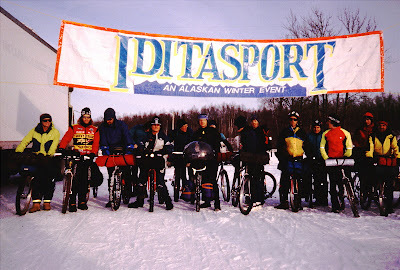 Remember that there were divisions for cyclists, skiers, and ski-jorers in '98 and '99. So not pictured are Bill M, Ralf Kuba, and one other ski-jorer whose name escapes me, as well as Tom Possert (who virtually invented the foot division by blowing everyone away and finishing that year). I can't remember if any skiers started the race in '98, but I'm 99% certain that no skiers finished.